Starting to heat up the Internet (well, at least in Russia and Eastern Ukraine, while likely not even to be acknowledged in Western Europe) is a hacked telephone call last week between the former Deputy Secretary of the National Security and Defence Council Nestor Shufrich and the former Prime Minister, recently-freed-from-prison, media darling Yulia Tymoshenko. The recording, which lasts just over two minutes, pulls no punches as Tymoshenko and Shufrich basically excoriate everyone associated with the events in Crimea, regretting they are not able to, in turn, shoot people in the head, fire nuclear weapons on them, and march down to Crimea themselves and start an armed retaliation campaign against all those who were for the referendum to secede from Ukraine and rejoin Russia. Tymoshenko is especially intense in her bravado, claiming that if she had been able to get down to Crimea the people would have been eating (expletive deleted) instead of succeeding in holding the referendum. I am not able to say at this early time that there can be no doubt whatsoever about the recording. Reliable sources in both Ukraine and Russia have authenticated it, but competing opponents have decried that it is either ‘fake’ or that famous Western media lament, ‘was taken out of context.’ Personally, I’m not really sure how making the region eat excrement or threatening to use nuclear weapons on people or shooting them in the face with automatic weapons can actually be taken out of context. Such threats are fairly explicit no matter what words precede or follow them. Interestingly, whether the recording is a perfect representation of the conversation between Shufrich and Tymoshenko or a total fabrication is actually not as relevant to me as a more subtle issue: just how poor Ukrainian leadership is at the moment and how this does not bode well for its immediate future. I have written in the past as to how I am no fan of Yanukovych. Indeed, perhaps one of the motivating factors that pushed Yanukovych to accept the more immediate, short-term oil and gas deal with Russia (which many attribute as the empirical factor that launched the Maidan revolution to begin with) over a more speculative, long-term trade relationship with the EU was how poorly his country had been fairing economically. Quite frankly, Ukraine had become a disorganized economic mish-mash mess and needed the money in real terms now rather than in more prospective terms later. Ironically, people in the West are quick to point out how much unfair suffering Tymoshenko has had to endure, being sent to jail in 2011, charged with exceeding her authority as prime minister by signing a new gas deal with Russia in 2009 that the rest of the cabinet opposed. Many claimed the charges were ludicrous: Tymoshenko may have made a poor decision, but not an illegal one. What perplexes me is how the West can make an angelic quasi-martyr out of Tymoshenko FOR THE EXACT SAME ACTION that forced Yanukovych to flee a revolution? Why is Tymoshenko’s deal ‘bad but not criminal’ while Yanukovych’s deal is worthy of forcibly ending his electoral term without new elections? BOTH deals were economic agreements signed with Russia. Is it just the fact that Tymoshenko’s was not done against a backdrop of possible EU collaboration (and so the West didn’t care) while Yanukovych explicitly turned away from an EU gesture (and so the West suddenly found an interest)? Again, please allow me to repeat that I really don’t care about Yanukovych losing his seat of power. As Machiavelli himself made clear centuries ago, if you can’t hold it, you don’t deserve it. The fact that Yanukovych can get his main political opponent sent to jail for doing the exact same maneuver that he hoped would save his claw-hold on power three years later shows what a self-serving and manipulative ‘leader’ he actually was. I think Putin himself has made it clear in subtle terms that he doesn’t really care who governs Ukraine as long as positive normalized relations with Russia continue (call it the Syrian Assad Gambit, if you will). He favored Yanukovych over Maidan leaders in Kiev because his assessment was that those leaders would likely try to cow-tow to Brussels and not Moscow. But this gets us back to the original point: the horrible options available for Ukrainian governance. 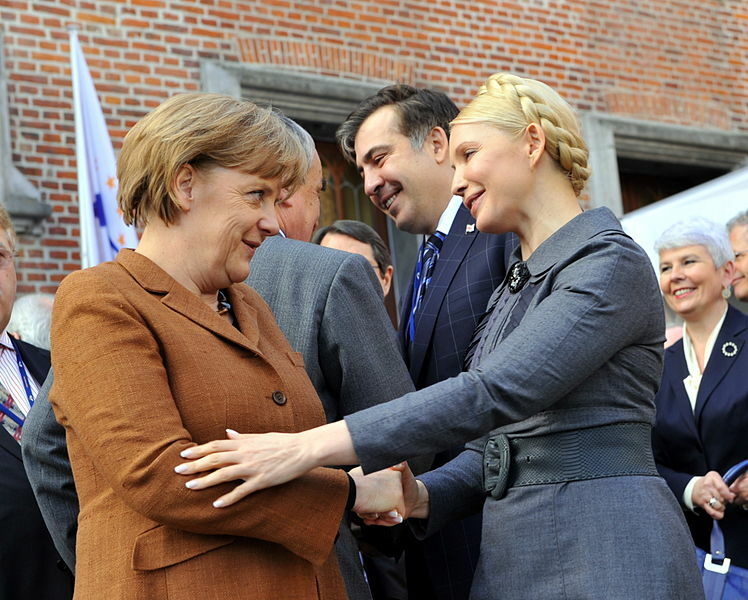 While most in the West won’t bother to go back far enough to see the extent of the Tymoshenko career arc, the former ‘Gas Princess’-quasi-oligarch-disgraced-former-Prime-Minister even changed her physical appearance over the years, discarding the ‘Alpha Business Queen’ dark chic she preferred to the lighter, halo-plait-blonde-crown Ukrainian Princess brand that has been her political alter-ego. Always a firebrand with a mouth to match her temper, this vulgar verbal history might be the thing that makes the hacked phone conversation so believable: it simply sounds like something Tymoshenko would say. And that is indeed a problem. It hints at narcissistic egomania that cares nothing for diplomatic statesmanship and rising above the fray, something most in the West would say is essential for effective leadership in an open democracy. After all, there are no such hacked phone conversations with Obama screaming obscenities about all the nasty and horrific things he would like to do to House Republicans in Congress for how they constantly try to derail Obamacare. You can rest assured he would LIKE to do that very thing but understands true statesmanship forbids it. And so here we sit. Yanukovych was no leader and helped run Ukraine into the ground while having gilded toiletries installed in his Presidential residence. Tymoshenko emerges from prison and clings to a Western media image that paints her as some modern version of Joan of Arc when in reality she is more likely to be Yanukovych with a braid: wanting the Presidency just because she thinks it’s her right, rather than because she believes she can better the plight of the Ukrainian people. I don’t take the hacked recording seriously, even if real, simply because it comes off not so much as a viable threat – Ukrainians being incited to kill Crimeans – as it does whining from the political losers. But that doesn’t make it any less relevant that Tymoshenko felt empowered to speak that way and formulate her thoughts in such barbaric and base terms. Beware the sheep with fangs, Ukraine. In the end the blood it spills might just be your own and for no good reason other than to satisfy its own power lust. Dr. Matthew Crosston, Professor of Political Science and Director of the International Security and Intelligence Studies program at Bellevue University, exclusively for the online magazine “New Eastern Outlook”.